Well, I am a total music guy. Not saying I am a musician, but I play music and the most important thing, I listen to music all day long. I listen to music when I drive, during my meal, when I woke up in the morning, when I went to sleep, if my bathroom have radio maybe I will listen to music when I use the bathroom or toilet also. I am a big fan of any kind of music. I have to admit that previously, I was a hip hop fan and loyal, I listen to only hip hop music and I look down on other genre of music. Forgive me for being like that but that was my past. Growing up with different type of friends, places and culture make me more versatile. I started to listen to any kind of music today and I am having a lot of fun like this. Just name it, I listen to Eminem, Britney, katty perry, Leona lewis, kitaro, Kenny G, enya, bjork, Statik, bunkface, siti nurhaliza, VE, laila’s lounge, peter pan, letto, and so on. I never put myself in a position where I need to discriminate a genre of music. For me, music is a gift from God. Even some says that music is not encourage in islam or even ‘haram’, but for me it is not like that. Forgive me when I says that one of my Ustaz said a long time ago that instead of listening to music, you should listen to Qoran recitation, which I found is correct but to blunt to put it that way. I have no intention to discuss on my theory and opinion too far in this entry. The point that I want to highlight here is about this arising small star here in Malaysia name Yuna. I listen to her song a few weeks ago from a friend (did Yuna have a youtube video before because I’m kind of seen her before in youtube). I was attracted to her style of song which I found a little bit resembles… I am not sure but I am sure she resembles someon’s style of music and her voices is like Dido. I saw her in you tube, a video showing her EP launching and I was a little surprise that this girl wears Tudung and hold a guitar and sing. I am damn sure that if I am a music producer, I would take her as my artist and produce her album and become fame in an instant. When we saw girls wearing Tudung (jilbab) here in Malaysia, the first thing you would think is they are shy, quiet and hidden. However, they are not actually like that, a lot of them are as competent as others but, I am not afraid to say that most of them are not. In term of academic, yes, but socially, they are bound to tradition and culture. Yuna is a symbol (for me) showing that everyone did a mistake regarding muslimah. I think she have a great marketing potential with that image. Looking to previous artist which wear Tudung, Waheeda, Beena, Heliza, a few only that I can remember, all of them bring this image with more showing to restriction and formality but Yuna bring a more casual personality centering the simplicity and reflect young teenager instead of an adult. This image would make her grow big in music industry I presumed. I have listen to her music and I would give my support on this young girl to move on and reach that meteoric rise in this industry. If she maintain her simple image like this, she would become one of the most recognize celebrity here in Malaysia. Finally, I would just say, wish her the best luck in her choices and I hope more people like this would appear. Lets bring some variety in our music industry. p/s: I am thinking since a long time ago, why every fashion designer in creating Muslim fashions always create something so formal. When asked, they would say that female Muslim cloth is suitable to go to some dinner party, some event and everything but no one seems to think on how a muslimah should look like when going to shop, watch movie, or hang out with friends. I think someone need to think about it. Almost all teenagers would like to avoid wearing a muslimah style of fashion because of their complicated way of design. Simplicity is better in my opinion. Do they look at all the young muslim girls, they always wear t-shirt, tudung and jeans. With that, they can go everywhere. Why don’t we create a simple design like this and implement it all over then we could get more people interested towards it. 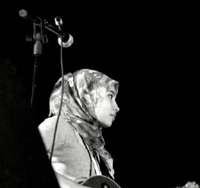 Yuna, a young newcomer in Malaysian music. A singer and a songwriter. hey.. yuna best.. kawan aku ada organise gig, dia kata crowd yuna memang ramai... aku pun minat jugak kat yuna..
To me, it's the same everywhere -- you simply cannot generalize everyone anywhere. Not only regarding hijab but also in a whole lot of other matters.